Recycledinc's Blog | Recycling your junk to make our city cleaner and help feed our children! Princess Kitty is a range of once off designer beds made for your furry lady to indulge in. Each bed is unique, although similar looking beds can be made, no two beds are identical. Prices range from R60.00 for single suite to R300.00 or more for special orders. Beds can be made to order and can be personalized as required. Only your imagination is limiting the fabulous-ness you can order on your special order bed. Full payment is required to secure special orders. And deliver is 2-7 working days, depending on requirements. Created with help from my dustbin. 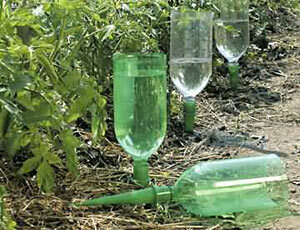 I hate seeing plastic bottles been chucked away to fill dump sites and clog storm water drains. Yesterday, I visited a local dump site with my partner Michelle and community coordinator, Winston. We will be launching a community clean up project in the area surrounding the site on 15th November 2011. We spoke to the locals living and working on the site, not only we they amused that I wanted the plastic bottles, roofing and grain bags, they were impressed with the idea that I would teach them how to create products out of the rubbish. I’m so excited to start working in this community. Urgently Needed – 600 pairs old jeans, too big, too small, torn, broken, any condition. For community sewing project, East London, donations only pls!!! If you’re proud of your little artists but at a loss when it comes to dealing with the sheer magnitude of their artwork, here are 12 of our favorite ideas for decluttering the fridge, preserving the most cherished works of art, and sharing your children’s masterpieces with family and friends. 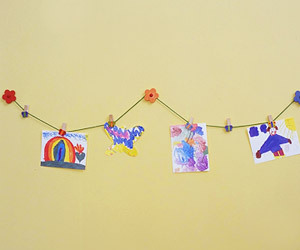 You can make your own clothespin display with simple items from the hardware store, or buy one like this Star Art Cable from Pottery Barn Kids. Hang it anywhere you like: your child’s room, an empty hallway, the kitchen… and rotate the art as often as you like! A simple frame can turn scribbles into home décor. These Dynamic Artwork Frames hinge on the side for easy access. You can display one piece of art at a time and hold up to 50 more behind it for later display. For a more affordable DIY solution, you can buy cheap frames (try the thrift store), remove the glass, arrange the empty frames on a wall, and easily rotate your kids’ art with a simple pushpin. If your walls have reached capacity but you still have precious artwork that you want to preserve, purchase a simple three-ring binder and some plastic sheet protectors. Have your child decorate the cover, and store the art binder with the rest of your family’s scrapbooks and photo albums, ready for you whenever you want to reminisce. Help your kids exercise their brains by turning their artwork into puzzles. They’ll be proud of both their art and their puzzle skills… and you’ll save money on puzzles! Simply glue a piece of art to a sheet of thin cardboard and cut into an age-appropriate number of shapes. For a double-sided puzzle, recycle the cardboard box from one of your children’s toys to use as your puzzle backing. If your kids consider themselves muralists, roll large artwork (and coloring pages from oversize coloring books) around a cardboard tube and use it for unique and economical wrapping paper. Save smaller works of art for homemade cards. Simply fold a page in half, write a greeting on the inside, and use for birthday cards and other special occasions. No more running to the card store at the last minute! 1. From your desktop, right-click any empty space, and then click Properties. 2. Click the Screensaver tab, and then click Settings. 3. Click the Photos tab. 4. On the “Where do you keep your digital photos?” page, click Add Folder, add the folder(s) containing your children’s art, and remove any other selected folders by clearing the check boxes. The family journal is a perfect tool for sharing your kids’ scanned masterpieces—and the stories that go along with them—with friends and family. Simply click “Jot down a moment,” upload the artwork, and share a story if you wish. From there, it’s simple to share it on your own family web page, via email or a monthly newsletter, or even on Facebook. Send some art to the grandparents, aunts, uncles, and any other interested parties. They will cherish it as much as you do and surely give it a place of honor in their homes. Online photo services, like Shutterfly, provide a huge variety of photo products to choose from, many of which are just as suitable for scanned artwork as they are for photos. You can preserve your children’s creative endeavors indefinitely in custom photo books, mouse pads, calendars, note cards, stickers… the list goes on. Although we haven’t found a great website devoted to free online storage of children’s art, numerous sites do offer free online storage and display of art in general. Your kids get their very own online art gallery, and you get an online backup and another way to share their creations with friends and family. We like the simplicity of art-3000. At some point, we all have to face the fact that we can’t save every single piece of art that our kids create. Once a month or so, go through the piles and choose to let a few go. If there are still more that you can’t bear to throw away and don’t have room to display, store them in plastic bins—one for each year if you’re really organized. Growing up I try all sorts of sports and activities. I would do some for a short time (maybe a day or two), others I would do for years. The bottom line was that no matter what I tried, nothing kept my interest. Now been a parent myself and my eldest child going to “big” soon, I thought I should do a bit of research and save myself tons of money. Twenty million kids register each year for youth hockey, football, baseball, soccer, and other competitive sports. The National Alliance for Sports reports that 70 percent of these kids quit playing these league sports by age 13 — and never play them again. According to Michael Pfahl, executive director of the National Youth Sports Coaches Association, “The number one reason (why they quit) is that it stopped being fun.” With figures like these, it’s time we rethink how we present youth sports to kids. With that in mind, here are some key points to remember about your kids playing sports. Focus on the element of play in any sports activity you introduce to very young kids. Make it fun! Don’t burden them or concern them with competition, keeping score, and rules. Get them running, kicking, throwing, catching … and laughing. Use equipment that suits their bodies and coordination levels (toss a beanbag instead of a ball). Adapt games according to their abilities. Always offer encouraging words for all their efforts. Parents and coaches need to be aware of what kids can accomplish at their differing developmental levels — physically, intellectually, emotionally, and socially. Don’t make unrealistic expectations concerning your child’s sports performance — be it in the area of muscle coordination, dedication, or attention span. Many kids lose their passion for youth sports during these years because they feel they can’t live up to their parents’ and coaches’ expectations. Kids start dropping out in big numbers at this stage. Playing sports loses its enjoyment for them and “fun” takes a back seat to winning. Pick-up games and just “playing for fun” should be encouraged. 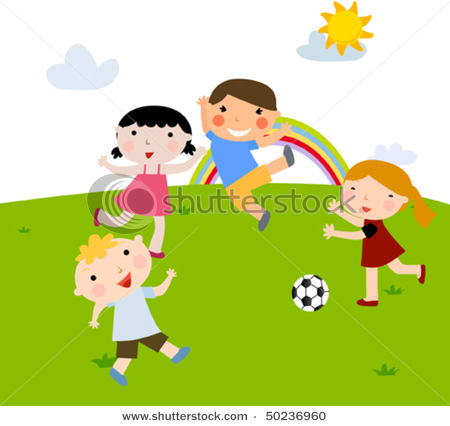 The key at this vulnerable stage is to keep them playing the sports they enjoy — if not on school or youth teams, then informally with friends. Not being on a team does not mean they have failed as athletes. It just means that they have to find other pleasurable ways to continue enjoying their sports. By this stage, it’s usually the successful high-school athletes who play both school sports and outside competitive-league sports. There are just so many positions to be filled on competitive teams. But what about kids who still love to play sports but can’t because of their demanding academic, social, and work lives? Parents need to remind these kids of the fun they had playing these games and help them to find time to play them with family members and friends. Helping your kids stay connected to the sports they love now can encourage them to remain physically active throughout their lives.